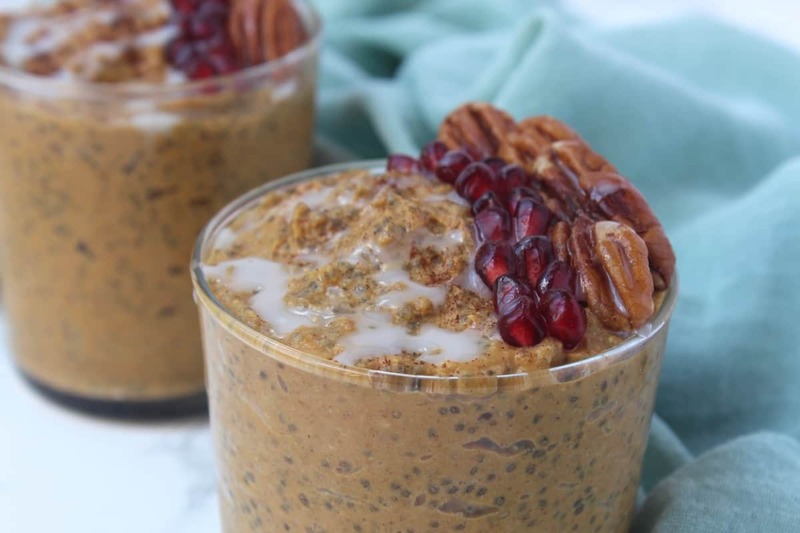 A simple and healthy fall inspired breakfast that will have you licking your spoon clean and doubles as dessert – Pumpkin Pie Chia Pudding. Hi Hungry by Nature readers!! I’m so happy to be here today! I’m Kelly, a food and fitness lover, CrossFitter, runner, and blogger over at Eat the Gains. My little space on the internet is devoted to providing wholesome and delicious recipes while also giving some inspiration and ideas for daily workouts. The recipes I create are healthy, while being easy to make and flavorful. I don’t follow one specific diet, but focus on real, whole, and nutritious foods. I also believe in moderation. While I love vegetables and working out, I also love sweet potato fries, a spicy margarita, chips and dip, and a lazy Sunday. It’s about balance and finding a place where you are happy and healthy! Now that it is officially October, pumpkin is in full swing. I’m pretty sure it’s been in full swing since September 1st, but I’m not one to immediately jump on the fall train. I’m at summer girl at heart and want to soak up every last bit of it. I also live in Austin, Texas (originally from the Northeast) and September here definitely does not feel like the fall I grew up with. 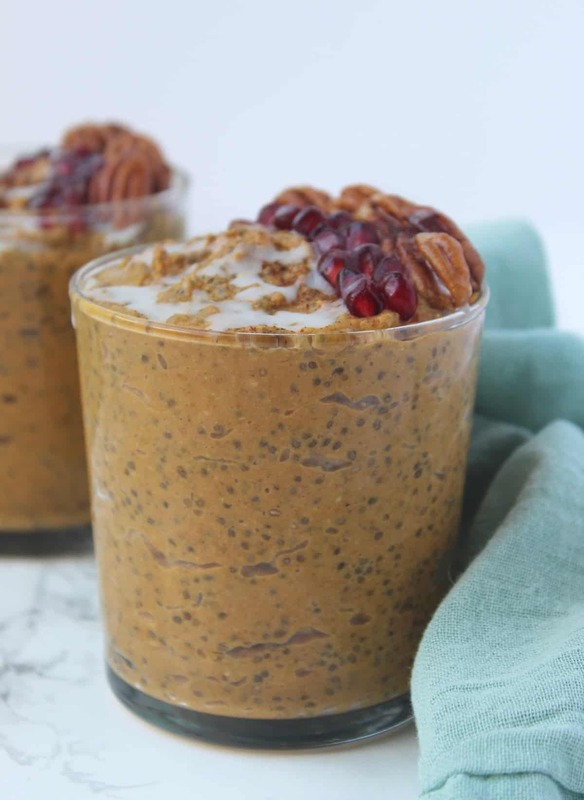 This recipe takes the flavors of pumpkin pie and turns it into a healthy and easy chia pudding. Pumpkin is loaded with potassium, vitamin A, and beta-carotene. Chia seeds pack protein, fiber, healthy omega 3s, and antioxidants. This chia pudding is also free of added sweeteners! All those health benefits for a dish that tastes like the pie you eat once a year?! Yes please! 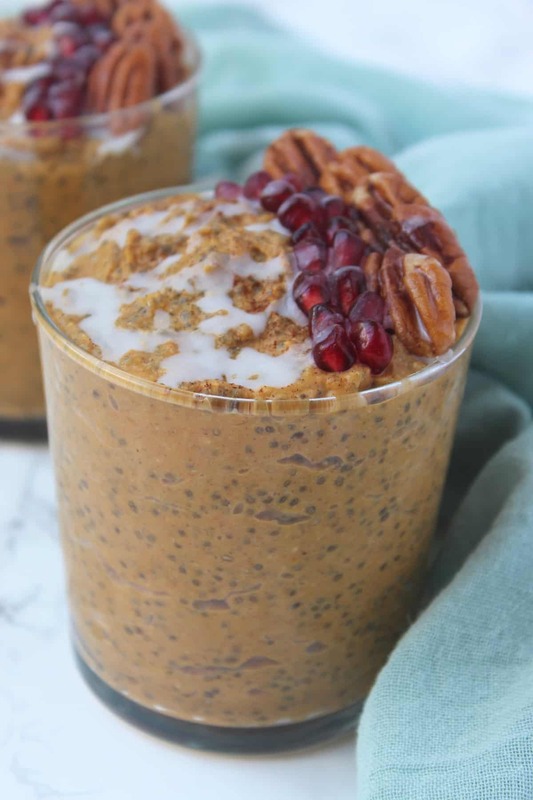 I have been eating this pumpkin pie chia pudding with my breakfast, as an afternoon/pre-workout snack, or after dinner for a little treat. It has a good balance of carbs, healthy fats, and protein and provides the perfect amount of sweetness. It is delicious as is, but I am loving it topped with some nuts, fresh fruit, or nut butter! I am thinking whipped cream would be amazing too! Toast the pecans. Heat a small skillet over medium-low heat and let it get hot, about 30 seconds. Add pecans and toast for 4-5 minutes, stirring constantly, until golden brown. Add pecans, pumpkin, almond milk, cinnamon, ginger, nutmeg, and salt to a high powered blender or food processor. Process until smooth and all ingredients are combined, about 1-2 minutes. Eat as is or top with desired toppings. How far ahead can you make these? Would they be ok in the fridge for a few days? You can definitely make these in advance. I’ve found chia pudding to last up to 5 days in the fridge – so you do make a bunch on Sunday and eat them all week long! What fruits do you recommend best for toppings? Chrissy – you can really do whatever fruits you like best! Pomegranate and pumpkin go great together, so I would suggest that. But I also love adding topping like granola, mixed nuts and seeds! I made it with the pomegranate seeds and added maple syrup – I’m going to make it again for work breakfasts with the granola topping. SO YUMMY! Yes! I’m glad it turned out well and that you love it!! Would this still be sweet? there doesn’t seem to be any kind of sweet ingredients? 🙂 thanks! It’s not super sweet. If you wanted it to be a little sweeter, I would add a tablespoon of maple syrup! Me too 🙂 let me know what you think of the recipe! Great recipe! I love anything with Chia seeds. I did add a little honey, which I like. Next time I will try pure maple syrup, as you suggested in the comments. Thanks Kim! And thanks for sharing – let me know how you like the maple syrup! This looks delicious! I am just starting an elimination diet and every ingredient in this is approved except for the almond milk. I was wondering what your thoughts are on switching it out for coconut milk? I know coconut milk is denser so maybe use less? I don’t use coconut milk very much so I would just play around with the amount and do what you think! If you use the boxed coconut milk, I wouldn’t change the quantity because that is pretty thin. Let me know how it goes! I used canned coconut milk and threw in a couple of medjool dates to sweeten it a little! I had about 1 cup of coconut milk in the fridge, and added about 1 cup of water to thin it out. I’m looking forward to having this for breakfast the next few days!! YUM Cora – that sounds delicious! I hope they turned out great! How did you like it with the dates? Did you chop them or leave them whole? I’m sure they were chopped! have any nutrition info on this recipe? am I missing it? Hi Amy – I don’t have any nutritional information on this recipe. But if you are really interested, you could plug all the ingredients into a nutritional calculator like My Fitness Pal! Absolutely my new favorite chia pudding. I used coconut milk and a greater quantity of the spices. Thank you for such delicious inspiration. Of course Tracy – I’m so glad you love it! This was absolutely delicious! I added 1 Tbsp of cinnamon because I misread the directions- but I like cinnamon, so I wasn’t too worried :)! I added a dollop of juice sweetened pumpkin butter and raw pecan pieces on top- so yummy! This will be one of my go-to Whole30 treats! That sounds amazing! Where can I find this pumpkin butter?! I get it from Wood Orchard Market in Egg Harbor, WI (Door County). You can order products online! They are closed right now for the Winter season and they don’t have their “juice Sweetened” products listed on their site, BUT you can email/call them and they will help you sort it out! When I go to Door County, I legitimately but a case of their pumpkin butter because it is SO good and then I am stocked for the whole year! Definitely check them out! This is by far the best chia pudding method on the net. It is perfectly proportioned unlike others I’ve made that have been just one big soupy mess I had to use a straw for. This comes out pudding consistency every time. I’ve probably made this at least a dozen times. Best thing is I have T1 Diabetes and I’ve eaten half the finished product at a couple times, and barely a blip on my blood sugar. Walden Farms pancake syrup coupled with some liquid stevia is my sweetening agent. I like the people who suggested coconut milk too…will be doing almond/coconut milk combo next time. Thanks for this method!! You are SO welcome Mike – I am thrilled that you are loving this recipe!! Hi Kim! I don’t count macros so I do not know offhand what they are for this recipe, but I would use https://www.myfitnesspal.com/food/calorie-chart-nutrition-facts if you want to calculate them yourself! How many Calories, Carbs, Fat. Protein grams? Are the pecans necessary for the consistency of the pudding, or would it be ok leaving them out? Hi Erin! I think the consistency will be okay without the pecans, but I haven’t tested it to be sure. MY guess is that it would be a little thinner. You could always sub in a Tablespoon or two of nut butter! Please let me know what you think of the consistency when you do! Help!!! What did I do? I have soup??? I’ve read the ingredients 10 times…put exactly the amounts indicated. I 2nd not successful. Help me, please? Any ideas??? Lori – did you put the chia pudding in the fridge to set? Yes..I made it last night. Came in from work today. Ate dinner..then I tried it. That is so odd! I have no idea why it is not working for you. The other thing I would try to is to blend it up first so it breaks through the shell of the seed and see if that does the trick! Ill give it another try…in the mean time I popped it in the freezer. Going to put it with frozen bananas. Always ways to change up things. When I try it again, ill let you know. Yes, please keep me posted! My only other thought is that maybe your chia seeds are old… not sure if that makes a big difference, but maybe! This was delicious! I used a can of coconut milk instead of almond milk and added a little maple syrup. Wow – such a treat! Wonderful Faith – I am so glad you enjoyed it!! This is a lovely light breakfast. 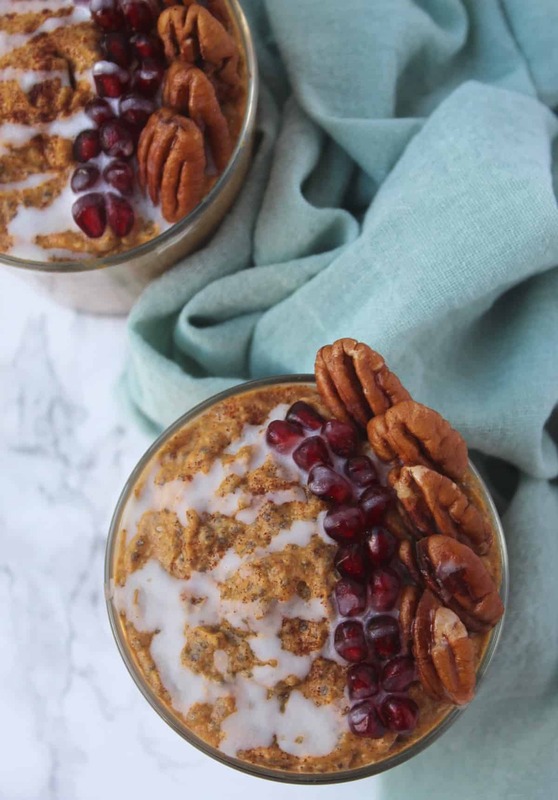 I use coconut milk, topped with chopped pecans and pomegranate seeds and it’s delicious. I’m going to serve it as an appetizer for Christmas brunch. My sister is on a very strict diet as she’s fighting breast cancer. This recipe has everything in it that she can eat ands she loves pumpkin so I’m excited to serve it to her. Thanks! Thank you Alice! And I am so happy to be able to share recipes that your sister can eat. I will be keeping you, your sister, and your family in my thoughts and prayers this holiday season! 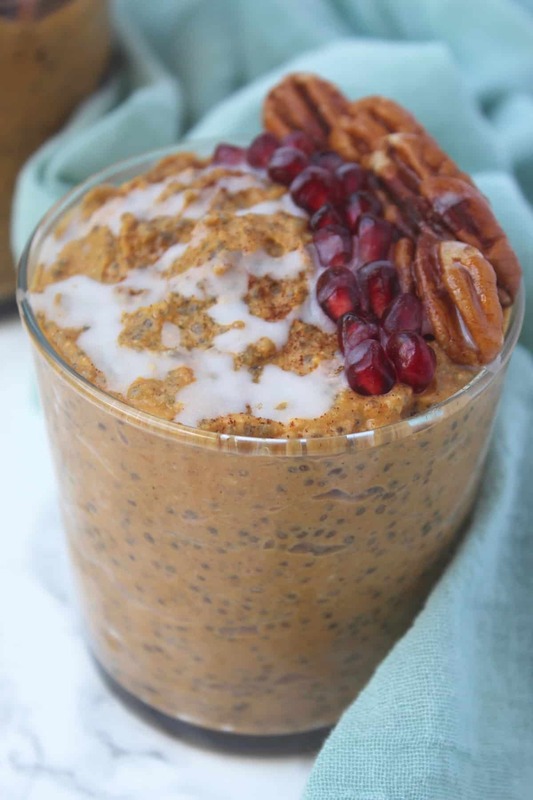 Ellie, this recipe for pumpkin chia pudding is so delicious! I added maple syrup like others suggested, and I mix in some hemp seed for additional crunch and protein when I eat it. Thanks so much, this is going into my regular breakfast rotation!